12. Graphene-paper based electrochemical sensors for biomolecules. Graphene-Based Electrochemical Sensors for Biomolecules presents the latest on these nanomaterials that have gained a lot of attention based on their unique properties of high mechanical flexibility, large surface area, chemical stability, superior electric and thermal conductivities that render them great choices as alternative electrode materials for electrochemical energy storage and sensor applications. The hybridization of graphene with other nanomaterials induces a synergetic effect, leading to the improvement in electrical conductivity, stability and an enhancement of the electrocatalytic activity of the new nanocomposite material. 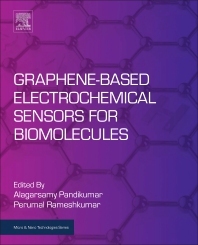 This book discusses the electrochemical determination of a variety of biomolecules using graphene-based nanocomposite materials. Finally, recent progress in the development of electrochemical sensors using graphene-based nanocomposite materials and perspectives on future opportunities in sensor research and development are discussed in detail. Dr.Alagarsamy Pandikumar is currently working as a Scientist in CSIR-Central Electrochemical Research Institute, Karaikudi, India. He obtained his Ph.D in Chemistry (2014) from the Madurai Kamaraj University, Madurai. His doctoral research focused on synthesis, characterization of plasmonic nanocomposite materials and its application of photo-physical/chemical properties in photocatalysis, photoelectrocatalysis and dye-sensitized solar cells. He successfully completed his post-doctoral fellowship tenure (2014-2016) at the University of Malaya, Malaysia under high Impact Research Grant. During his post-doctoral research, he developed several graphene based metal, metal oxide, polymeric nanocomposites for electrochemical sensors and dye-sensitized solar cells applications. He was appointed as a Research Assistant Professor in Department of Chemistry &	Research Institute at SRM University, India. His current research involves the development of novel materials with graphene, graphitic carbon nitrides, transition metal chalconides in combination to metals, metal oxides, polymers and carbon nanotubes for photocatalysis, photoelectrocatalysis dye-sensitized solar cells and electrochemical sensor applications. His results outcomes were documented in 95 in peer reviewed journals including 8 review articles; among them seven of the key articles have been cited more than 50 times and also have 1600 citations with the h−index of 24. On other side, he served as Guest Editor for a special issue in Materials Focus journal and edited 4 books for TransTech Publishers, Switzerland. Dr. Perumal Rameshkumar is currently working as an Assistant Professor of Chemistry at Kalasalingam University, India. He obtained his M.Sc. (chemistry) (2009) from Madurai Kamaraj University. He joined as Junior Research Fellow (2010) at the same University and subsequently promoted as Senior Research Fellow (2012). His doctoral thesis focused on “polymer encapsulated metal nanoparticles for optical and electrochemical sensor applications. He worked as Post-Doctoral Research Fellow (2014) at University of Malaya, Malaysia in the field of “graphene-inorganic nanocomposite materials for optical and electrochemical sensor applications”. His current research interests include synthesis of functionalized nanomaterials, optical sensors, energy-related electrocatalytic processes, electrochemical sensors and supercapacitors.